Because of you, the Food Share’s Meals on Wheels team provides lunch daily to seniors at Center 50+ and the South Salem Senior Center. Nutritious, tasty meals are important, but volunteer Charlie King knows that a friendly smile, conversation and an extra special birthday celebration are important, too. 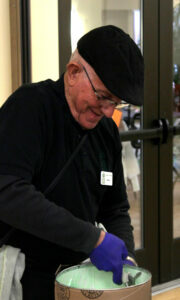 Two years ago, a visit to Center 50+ sparked the beginning of Charlie’s volunteer gig at Meals on Wheels. When he first arrived at the dining room on a third Friday, he found out about their birthday tradition – a piece of cake for dessert. Charlie’s own birthday is at the end of April – which happens to be National Volunteer Month. The now 82 year old served pistachio and almond ice cream to all the guests before finally sitting down to enjoy his serving. Charlie’s connection to his current volunteer work goes beyond birthday celebrations. On Mondays and Fridays, Charlie begins his shift by helping staff set up for Meals on Wheels home delivery and then serves lunch to his peers. “It helps people and it helps me,” Charlie said. Sometimes the dining room has numerous volunteers, but occasionally Charlie is the only extra set of helping hands. “We could really use one or two more people on a busy day and it’s a fun thing to do,” Charlie said. After a 42-year career with ODOT and numerous volunteer gigs, there is no sign that Charlie is slowing down. When he is not serving at Meals on Wheels, he’s spending time with his grandchildren or working in his garden. He and his wife have also donated about 300 pounds of food from their garden to a food pantry at their local church, West Salem United Methodist. Because of generous people like Charlie, more families and seniors in our community have healthy food when they need it most.